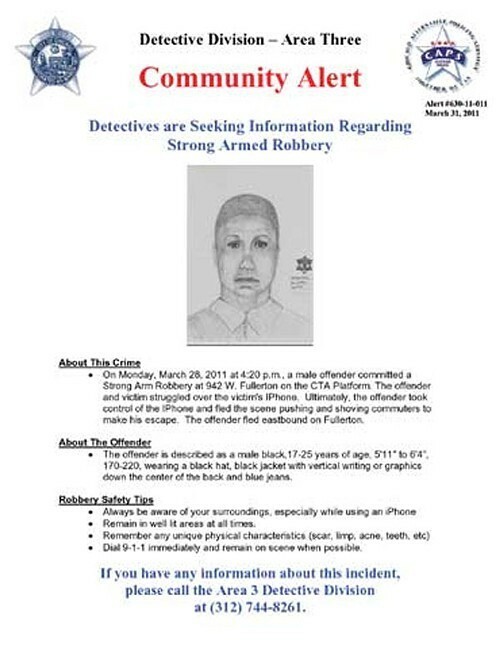 Chicago police have released a sketch of the man they say is responsible for the death of a woman as he fled the Fullerton el stop after stealing an iPhone Monday. He is described as a black male, age 17 to 25, 5'11" to 6'4", 170 to 220 pounds. He was last seen wearing a black hat, a black jacket with vertical writing or graphics on the back, and blue jeans. Anyone with information is requested to contact Area 3 detectives at 312-744-8261. The image is after the jump. Illinois cuts writing test requirement; civilization doomed?